When performing thin layer chromatography, the most common method of spotting samples on the silica plates is using something called a capillary tube. Capillaries tubes are just thin glass tubes that draw and deposit liquids via capillary action. While this in itself is rather mundane, the method of preparing them is some of the most fun I have in my labs. Shown below is a short video on the preparation of the tubes. 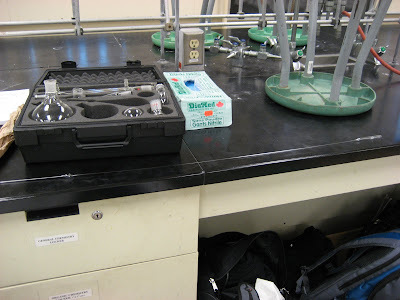 The gentleman in the video uses small tubes to produce two capillary tubes with every pull, but in my labs I prepare the tubes from glass pipettes and larger butane torches. This is what accounts for the very large size and bizzare shape of the tube I have shown in the picture at the beginning of the post. From these large tubes I can make many (about 10) usable capillary tubes for my TLCs. Here's a video of me pulling some tubes while I was waiting for an aldol condensation reaction to finish.